BR 350 | Prinoth Lubomír Rek s.r.o. The BR 350 sets the standards in the grooming and maintenance of ski slopes: superior engine performance, top reliability, user-friendliness, and the highest levels of driver's comfort and ergonomics. On top of that, the completely glass-enclosed driver cab offers optimal visibility at all times. For the Highest Demands in Ski Slope Grooming. Caterpillar power: A 355 hp Caterpillar 8.81 l turbo diesel engine with fully electronic engine management to get the job done quickly. Driver's cab – extras included: Electrically adjustable seat, hydraulic servomechanism, radio, satellite reception, high performance lighting system, etc. 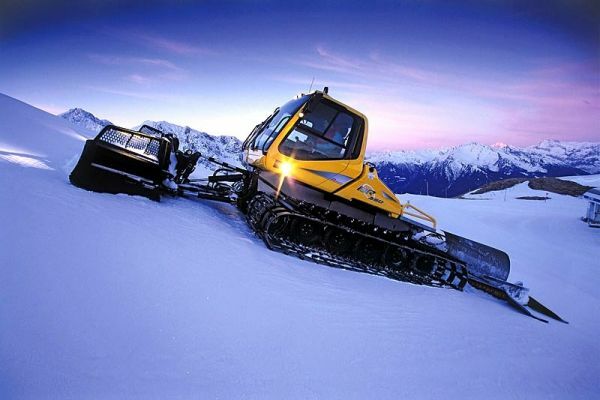 Posiflex Tiller: Perfect ski slope preparation at high speeds. Sherpa drum winch: Easy to operate, reliable, maintenance-friendly, automatically adjusts to the vehicle's speed. Clearing blade: High thrust even with low power usage. Type 2 front wheels mounted on cranking arms and steel torsion bar. 8 wheels on walking beams mounted on cranking arm and heavy duty rubber torison blocks. Steel type Semi-closed profile steel cross-links or aluminium cross-links. Both mounted on rubber belting.